We got the last puppy and in the hands of technician we saw a cramped and tense animal that piddled and pooped. She was given to us with diagnosed incontinence and words of encouragement: "We hope that she will be better." Until then she was treated like an object, a "leg" for a test operation, with an installed microchip and tattooed number on her ear. During our holidays in Rijeka, we were notified that a little beagle from the Faculty of Veterinary Medicine in Zagreb has been given to our care. We put up a record in packing bags and hurried to the Animal Friends activists, we came last for the "adoption." We couldn't be happier. We got the last puppy and in the hands of stockman we found a cramped and tense animal that piddled and pooped. She was given to us with diagnosed incontinence and words of encouragement: "We hope that she will be better." Her condition in the cage of the Faculty of Veterinary Medicine was immortalized by photographer Patrik Macek on a photograph which was awarded "The best newspaper photograph of year 2005;" a picture says more than thousand words - that was our Ria! Until then she was treated like an object, a "leg" for a test operation, with an installed microchip and tattooed number on her ear. She was 1,5 years old. Which she spent in a cage. Tiny, a little bit undeveloped, in fear of all humans and not knowing anything about the outside world. In the beginning she was even afraid of us. She kept hiding in hidden nook of the kitchen's dining area. For one month, every time we wanted to take her out for a walk, we had to pull her out with our hands. A walk! In a closed yard where she was running in a circle and jumping on the wall. She didn't make a sound (bark), she didn't drink water, she held her tail between her legs. She was diagnosed with gastritis (she eats only diet food) and she has slight heart problems. We were going to the doctor Sonja Posaric on a therapy so Ria would free herself from stress (because of isolation, pain, shock). She got vitamins so she would get physically and psychically better. She started to go out for a longer walks during which she would gladly spend time with other dogs. After three months she waved with her tail for the first time and a few days later, she barked on the sound of a bell. There was no end to our happiness! She sleeps in the basket and in the morning, when she hears the alarm, she scrapes our bedroom door. In the mornings she likes to cuddle and completely wake us up. She really likes to eat. If we are preparing food too long, she mumbles. She learned our daily program and she gladly welcomes everyone, especially Marian who takes her out for a walk. She is the happiest when we go to the country side in Zagorje where she can run around. She is extremely obedient and brave (with other dogs), but she has very bad nerves so we get to know her with everything she did not se before. That is our Ria! 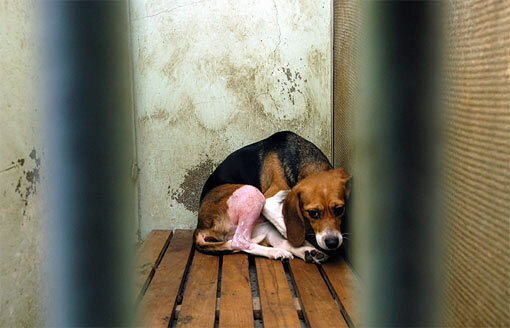 Once called "a cage dog" like she has nothing except a body for testing! No. She is a cheerful creature who learns everything and who makes us happy.